Steinel’s premium 458 SOCOM hunting load. 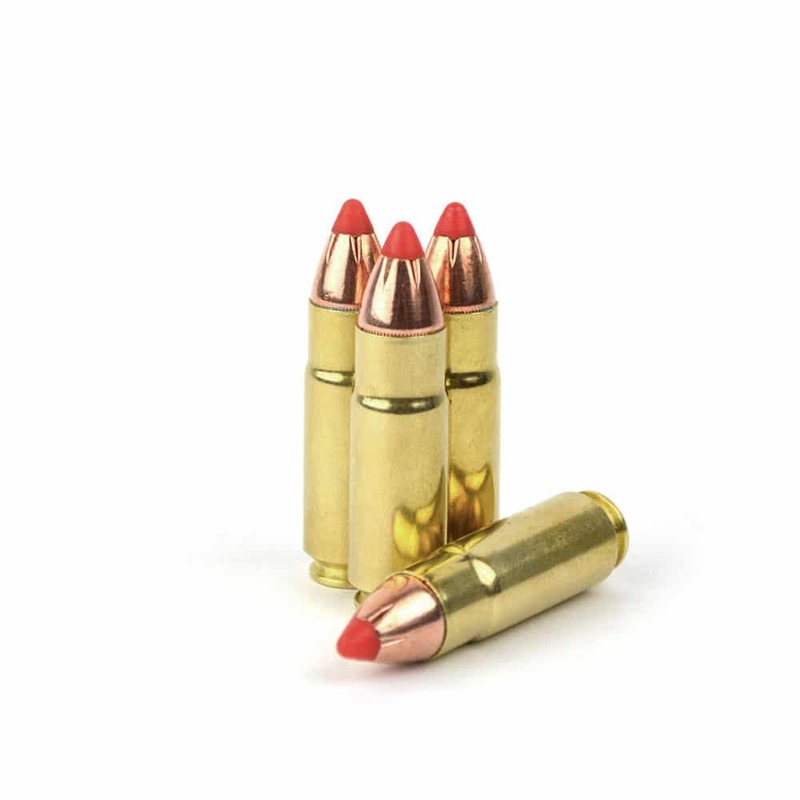 This round utilizes the proven technology of Hornady’s 325-grain FTX bullet. This accurate, powerful, and consistent SOCOM load is the best performer available anywhere at this price point. Starline Brass CCI Primers Premium Magnum Powder 1,740 FPS (16″ barrel). Reliable and effective. We love our 458 SOCOM! Major power down range. It doesn’t get any better than Andy and Steinel Ammo (XCaliber)! We love our 458 SOCOM! Major power down range. It doesn’t get any better than Andy and [Steinel] ammo! This was 325 gr .458 SOCOM FTX. 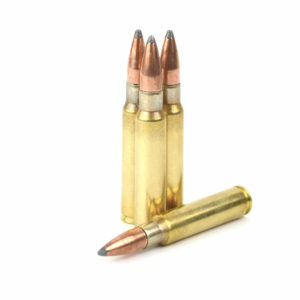 The ammo is accurate and had improved cycling performance over the 300 gr. hollow points. Both are accurate. I appears that the crimp for both is about .001 to .002 inches (as compared to a new empty Starline Brass case). There is just enough of a lip on case these to occasionally hang on the upper bolt locks in my particular gun. There was evidence of small brass shaving between the bolt lock and the chamber after firing. Though to be fair, my SOCOM does not have enough rounds through to be broken in yet (32 rounds total through it, including, these FTX, some Steinel Ammo (XCaliber) HP, and some FTX handloads). The more I use it the better it seems to cycle. I put some hand loads through it of a similar FTX load with a heavier crimp of .003-.004 inches and they seemed to cycle more reliably. But as I said, it still have to breaking in to do. This is a firearm issue and is not related to the ammunition. All rounds were checked with a Wilson Combat case gauge prior to firing and all past the gauge with no issues. A little polish on the feed ramp and another 50 rounds or so for break in should clear this issue up. This was 325 gr .458 SOCOM FTX. The ammo is accurate and had improved cycling performance over the 300 gr. hollow points. Both are accurate. I appears that the crimp for both is about .001 to .002 inches (as compared to a new empty Starline Brass case). There is just enough of a lip on case these to occasionally hang on the upper bolt locks in my particular gun. There was evidence of small brass shaving between the bolt lock and the chamber after firing. Though to be fair, my SOCOM does not have enough rounds through to be broken in yet (32 rounds total through it, including, these FTX, some XCaliber HP, and some FTX handloads). The more I use it the better it seems to cycle. I put some hand loads through it of a similar FTX load with a heavier crimp of .003-.004 inches and they seemed to cycle more reliably. But as I said, it still have to breaking in to do. This is a firearm issue and is not related to the ammunition. All rounds were checked with a Wilson Combat case gauge prior to firing and all past the gauge with no issues. A little polish on the feed ramp and another 50 rounds or so for break in should clear this issue up. The rounds chamber and shoot great from my brand new Radical Firearms 16″ barrel upper. Accuracy at 100 yards was between 1 & 2 MOA for a 3 shot group. I haven’t run them over my chronograph to verify advertised velocity. I did have FTF issues but I believe fault lies with the rifle’s feed ramp, not with the ammunition. I also believe the FTF issues I had were because I was using a lower with a 3 ounce carbine buffer. The upper came on a new Radical Firearms lower that has a 5 ounce rifle buffer. I feel that with a 5 ounce carbine buffer and grinding/polishing the feed ramp, my feeding issues will get resolved. I had zero feeding issues with this ammunition. It shot nice tight groups. I have purchased it a few times and will do so again in the future. I would recommend it to anybody. I bought a box of these to try in my new Radical firearms upper. Recoil was very manageable, and groups were very accurate, at about 75 yards with iron sights. Went through 13 gallon water jugs exploding them and was found well expanded in wet phone book. I will definitely use these when hunting, controlled expansion good penetration, and stopping power like no other! Just received your .458 300gr JHP & 325gr Flex Tip rounds to try for the first time on my RRA Beast AR. Have to say, they are everything and more when compared to more expensive rounds. I will definitely purchase these again. These rounds are clean, accurate and cycle smoothly. Hogs at our place have met their match! Thank you for quick shipping and terrific service!